Comfort. We each seek comfort in different ways – some through hugs and kind words, some turn to alcohol, some would indulge in their favourite foods, and some go for retail therapy. I do them all, but in a slightly different order – food, alcohol, kind words and lastly, retail therapy. I’ve never been big on shopping because my wallet isn’t fat to begin with. But I do enjoy stuffing my face with whatever limited funds I have can pay for. Last week, I found solace in Joshua’s mis-mash of kind words and witty sarcasms, and we also ate a delicious calorie-laden lunch so I could self soothe. I call this place the temple of “ganja” – KM Kitchen, just opposite FGA Church in Jalan Kuchai Lama. “Today, add extra ganja,” he said to the lady boss, when ordering their house specialty — fusion noodles. Joshua also ordered a plate of ginger beef kuay teow and a small serving of fried kai lan with salted fish so I don’t end up eating Christy and Pei Gee (they would make good pai kuat wong) if there weren’t enough food on the table. Gooey egg yolk always makes my day! My kopi ice was extra thick and went well with the ham, cheese and egg sandwich we ordered to share. The sandwich was a no brainer: ham + cheese + egg + bread = comfort food. I would have preferred the cheese to be melted, but all is forgiven once I bit into the warm, runny yolk. I liken this to the Asian sister of the Croque Madame. The fusion noodles lived up to its reputation. Before I get chided for purportedly taking drugs in public, the ‘ganja’ in mention is the copious amount of butter in the gravy. 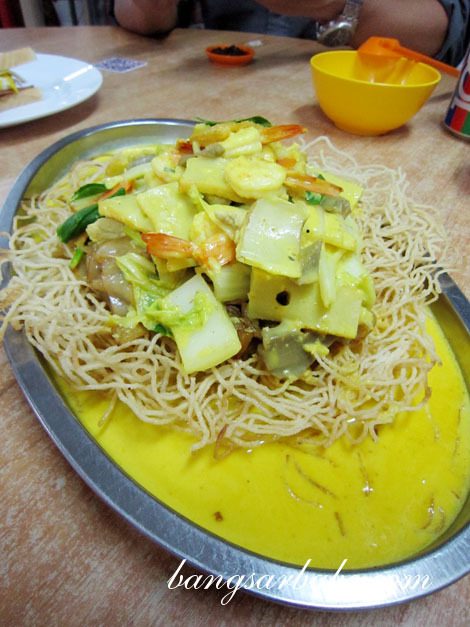 Think butter crabs, with noodles in the place of crabs. 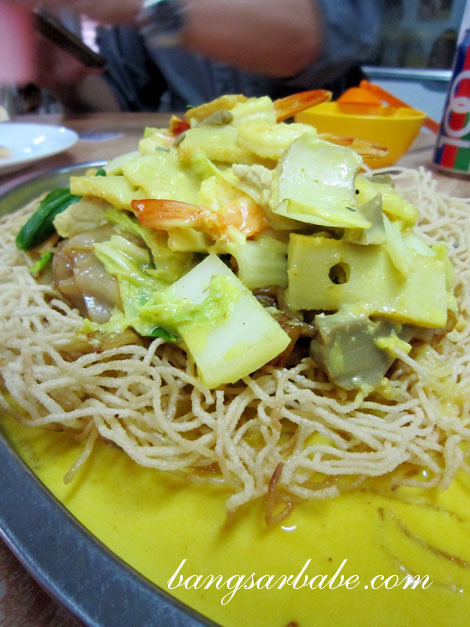 The egg noodles were deep-fried till crispy, while the kuay teow was well flavoured with a good dose of wok fire. But they were only sidekicks to the butter gravy. Aromatic from the curry leaves, the gravy was thick and creamy from the combination of butter and evaporated milk, while the cili padi gave it a mildly spicy kick. Also good was the ginger beef kuay teow. The gravy was eggy and not overly starchy with a generous amount of beef slices – tenderized, well marinated and pleasantly chewy. I liked that young ginger was used so the texture was smooth and easy to eat. 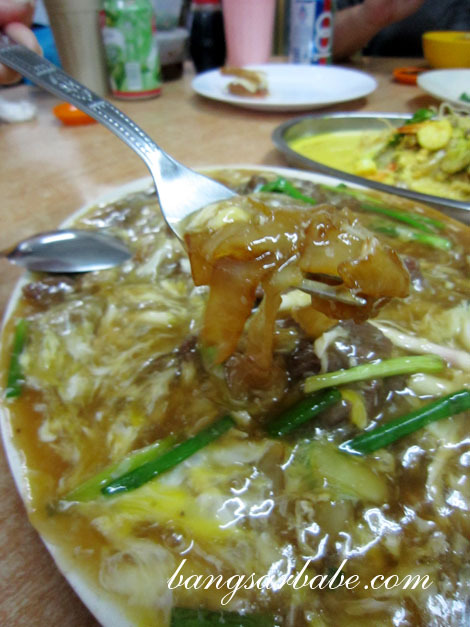 Like the fusion noodles, the kuay teow had a good smoky-char flavour and paired well with the gravy. Not the best I’ve eaten, but certainly decent enough to recommend. Verdict: For a buttery-rich, artery-clogging experience, order the fusion noodles with ‘extra ganja’. I’m definitely coming back for more! buttery noodles. that is just too sinful! temple of ganja ?? 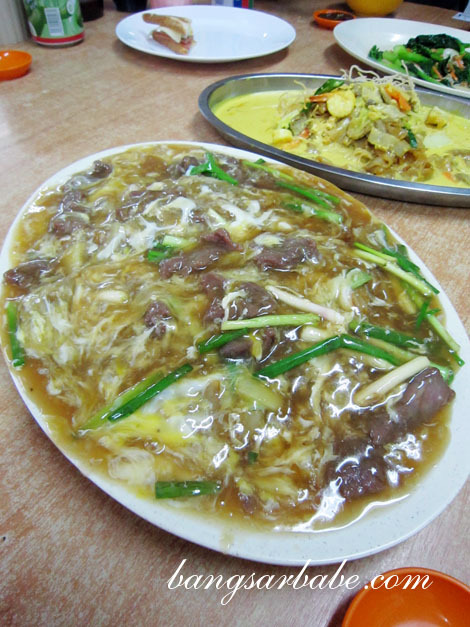 ooo boy … give me some please .. it spreading to me ..
the ginger beef keow teow looks very delicious..
Hahaha! It is very addictive. But if you’re greedy and drink all the gravy, you’ might feel ‘jelak’. runny and creamy eggs definitely make a good day and a good meal! I don’t think I have seen any noodles of this style in Penang~ Should be real good business if start one outlet here~ 😛 Yummy! A buttery rich artery clogging experience!!! do they open for dinner? got the gps coordinate for it?